An erratum published today in Climate Dynamics shows that climate models have exaggerated heat accumulation of the oceans by about 66,590 Hiroshima bombs per day vs. observations over the past ~50 years. That's indeed a travesty of a lot of "missing heat." According to the corrected 700 meter heat content data below, observations show about 54% less heat accumulated than predicted by climate model simulations. Observations show the global oceans have warmed only 0.09C over the past 55 years, which demonstrates the IPCC has exaggerated the effect of CO2 on the climate by a factor of at least 5 times. According to the authors, "the historical [model] simulations still overestimates the heat content trend over this last time period [1970-2005], which could be related to the too large climate sensitivity" to CO2. In Fig. 3 of the published version, the heat content was integrated down the 200 m only in the model simulations, thereby biasing the comparison with the data, which are themselves integrated down to 700 m. The new figure shows the heat content integrated down to 700 m both in the simulations and in the data. This correction generally improves the comparison of the model simulations with the observations of heat content for the most recent period, especially in the Atlantic basin. 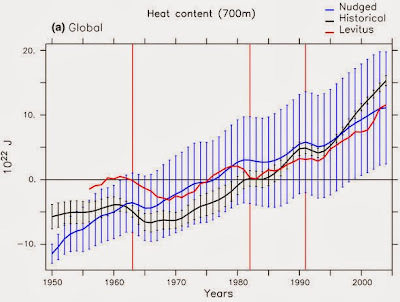 The corrected numbers in section 3.1, concerning the computed trends for global heat content from Fig. 3 for the period 1955–2005, are 113.1 TW (r2 = 0.98) in the nudged simulations and of 129.5 TW (r2 = 0.84) in the historical simulations as compared to the trend of 69.5 TW (unchanged, r2 = 0.70) in the data. The agreement is therefore lower over this time period than suggested in the published version, but it increases if computed over the more recent time frame 1970–2005 with 115.5 TW (r2 = 0.96) in the nudged [fudged] simulations, 189.0 TW (r2 = 0.96) in the historical simulations and 108.6 TW (r2 = 0.83) in the data. While the historical simulations still overestimates the heat content trend over this last time period, which could be related to the too large climate sensitivity in IPSL-CM5A-LR (Dufresne et al., this issue), the nudging [fudged model] leads the heat content to be closer to the observations. We believe that this error may not modify the main messages of the paper, which are more related to the impact of volcanoes on the AMOC. 3. Due the 1st and 2nd laws, an ocean that is 0.09C warmer can only warm the atmosphere by an additional 0.09C. So how come glaciers all across the globe have been shrinking dramatically over, say, the past century? That's what happens during an interglacial - ice continues to melt until the next ice age occurs. The Little Ice Age ended 150 years ago and was the coldest period of the past 10,000 years, so yes, glaciers are melting faster now than 150 years ago. The solar maximum in the latter 20th century is the driver, not man. During the last interglacial [Eemian], sea levels were 31 feet higher than the present and Greenland 8C warmer than the present. There is no evidence that the current interglacial is any different. Long term we are in a COOLING trend. A more recent paper looking at glaciers in Norway. …. A multi-proxy numerical analysis demonstrates that it is possible to distinguish a glacier component in the ~ 8000-yr-long record, based on distinct changes in grain size, geochemistry, and magnetic composition…. This signal is …independently tested through a mineral magnetic provenance analysis of catchment samples. Minimum glacier input is indicated between 6700–5700 cal yr BP, probably reflecting a situation when most glaciers in the catchment had melted away, whereas the highest glacier activity is observed around 600 and 200 cal yr BP. During the local Neoglacial interval (~ 4200 cal yr BP until present), five individual periods of significantly reduced glacier extent are identified at ~ 3400, 3000–2700, 2100–2000, 1700–1500, and ~ 900 cal yr BP…. The authors of BOTH papers simply state that most glaciers likely didn’t exist 6,000 years ago, but the highest period of the glacial activity has been in the past 600 years. This is hardly surprising with ~9% less solar energy. ….the June 21 insolation minimum at 65N during MIS 11 is only 489 W/m2, much less pronounced than the present minimum of 474 W/m2. In addition, current insolation values are not predicted to return to the high values of late MIS 11 for another 65 kyr. We propose that this effectively precludes a ‘double precession-cycle’ interglacial [e.g., Raymo, 1997] in the Holocene without human influence….